Nothing happened. Just that the Comiket 73 at the Tokyo Big Sight or 東京ビックサイト (International Exhibition Center; 国際展示場) had took/is taking place from the 29-31 Dec. The crowds are like crazy. How crazy? Well think of it as a subway train in the central area of the city fully packed with people. Photos were forbidden there except the cosplay area. Also, to get in, there is an extremely long line and had to wait for an extremely long time to get in. Had to head there early to avoid the crowd, though the earliest train to there is already crowded (note that the Taxi fare rates there are the 2nd most expensive after London). The image on the right would give you some idea on how crowded it is from the previous comiket. Below is an overhead image from Google Maps/Earth showing the location. It's just next to Tokyo Bay. The Big Sight is just on the right of the text 国際展示場正門 in red. 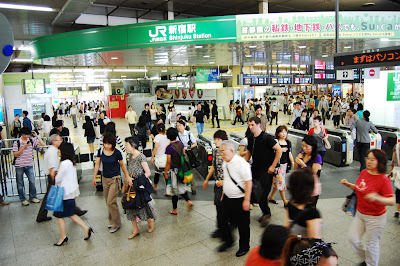 Shinjuku Station (新宿駅) is one of the busiest station located somewhere near the Shibuya area. So busy that it recorded an average of about 3.31 millionper day last year (2006). Since it serves that many people, of course, there are about 25 train platforms served by 5 different operators along with about 200 exits. It's so large that you can compare it with a small city. Of course, like any other station there is an automatic fare gates (except in towns and villages which may not have any). The card used to enter is called Suica (based on Sony's Felica, which is also used on the Octopus Card in Hong Kong and some card in Singapore with an uncreative name). 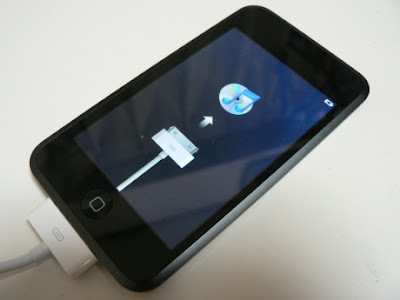 It can also be embedded in mobile phones (Keitai denwa / 携帯電話). That's why there you can see people putting wallets, handbags and keitai on the card reader to enter. Of course, there are machines to purchase tickets. The worst thing that could happen to anyone is having a writer's block. Back in secondary school, I always seem to be unable to come up with anything when doing the assignment of writing essays or writing more than what is already provided. Of course, this would be worse if it involves creating something new or choosing whatever topic I like. I got this project to do that is to be done by the 9th of next month, but I'm already stuck at the 1st slide. It's supposed to last for 10 minutes. My laptop comes with Microsoft 2007 but it's on a trial period until I enter the serial number. 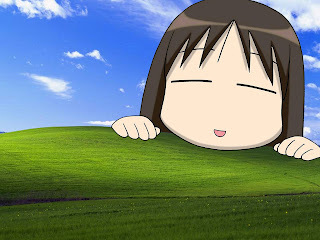 So I end up using OpenOffice.org instead unless I'm using a different PC. Maybe I just don't know how exactly to do this. Or maybe its just that I just lack of exposure of learning. If only I could turn back time or things happening differently in the past, things could be different now. The black part near the top you see in the picture on the left broke some time ago when I was moving boxes up there. As I had removed the mattress below earlier to do stuff under the bed, I managed to grab hold of the closet to the right (not reflected in the image) in time. The frame of the bed looks like its falling apart (it's made of wood) and could break at any moment. The furniture set is quite old. It's been around since I moved in in Dec 1996 (11 years ago). 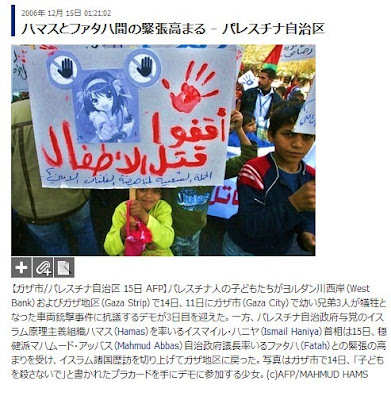 I know this image is 375 days old, but I find it quite amusing that Haruhi (from 涼宮ハルヒの憂鬱) on a protesting sign in the Gazaa City by a kid. What is even more amusing about this is that this image appeared on intenational news (via Agence France-Presse, a french news agency) on newspapers and online worldwide. I wonder what they were thinking. 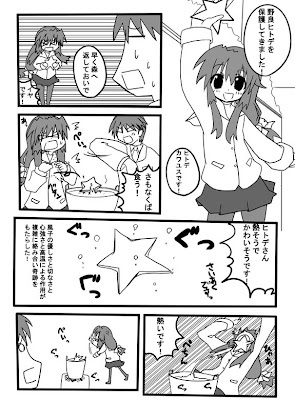 I don't know why but that "thing" (I can't say it here) above "random image (from anywhere)" is in japanese sometimes. 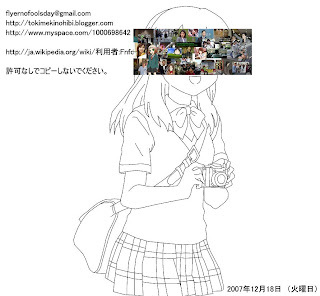 Another thing is that the banner of the same dimentions on my other blog has images instead of static text. There is a class outing for IQ0704F of ITE college central bishan at East Coast Park this Saturday, 22 Dec at 9:30am (i think). The meeting place is at the MacDonalds there. The direct bus to there is 401 from Bedok interchange, but that bus operates on Sat, Sun & Public Holiday. On saturdays, it operates from 2pm-10pm with intervals ranging from 20-29 mins and 10am-8pm on Sun/PH. I spent most of the day adding missing/corrupted information, making sure that compilations in an album appear together instead of seperately, and adding album images. 18 Dec (Tuesday): 9:50am - 1pm, outside ITE Bishan staff room for video editing21 Dec (Friday): 10am onwards, meet ming rong and skye outside payar lebar MRT station.22 Dec (Saturdy): 9:30am onwards, class outing at East Cost park MacDonalds (no idea how to get there).until 8 Jan (Tuesday): Prepare presentation for business communication. 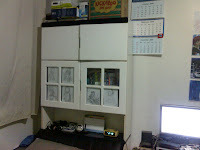 8 December 2007 (Saturday): Stayed at home most of the time. Decided to make major changes to my 3rd and 4th profile after making this post just the night before. 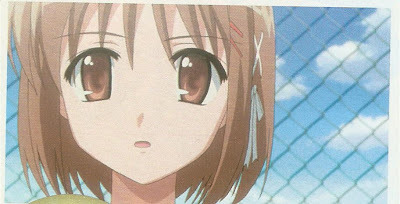 Managed to watch "ef - a tale of memories" and "灼眼のシャナII" (Shakugan no Shana Second). I had changed the layout as the prevous one had problems displaying images from my previous post. Under the previous layout, you wouldn't be able to see the clock or the woman on the right of the image. You could only see the rest and the shadow of that person. The same goes for images of the same size. Since the layout has changed, I try to make the page elements at the same position as before (only on the left instead of right). Also, I have reduced the number of post appearing on the main page from 10 to 5 since the average post is quite long, even without images. This would also help people with slower bandwidth to load the page faster. To view the earlier posts, you can just go to the archive tree at the bottom of the sides. 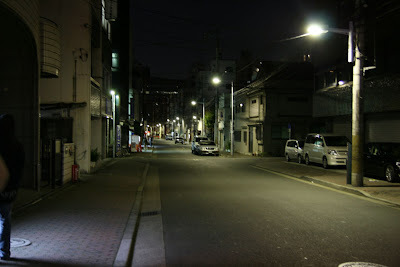 (Since my posts are long most of the time, it might be located midway throughout the blog.) I have also enable annonous people to post comments on my posts. As you can see, there are celebrities in there from a lousy camera and angle. That same camera is used for this post and the next post.